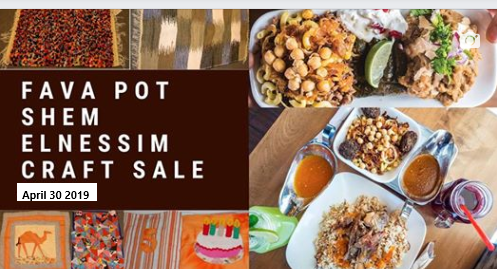 Join us as we celebrate Sham El Nessim, an ancient Egyptian celebration of spring, at Fava Pot, an Egyptian Mediterranean restaurant in Falls Church, VA! Welcome spring with us by immersing yourself in the Egyptian culture! Enjoy a delicious meal prepared by the chefs of Fava Pot and shop for handicrafts made at HANDS’ projects in Egypt. Most products are made by artisans at the Association for the Protection of the Environment (APE), a job skills training program for women living and working in the garbage collectors’ community in Cairo. The handicrafts are made from clean, recycled materials, and proceeds provide increased opportunities for young women in the community. This is a great opportunity to get a Mother’s Day or graduation gift. We hope you, your family, and your friends can celebrate this new season with us!